Built in 1856, this simple structure was built by J. Campbell, who erected many other buildings in the mid 1850s, and purchased by the Illinois Central Railroad Company that same year. The Doane House was one of the longest standing buildings in the mid-late 19th century, when Champaign was still known as West Urbana, despite city fires that often consumed blocks of stores and houses. Built at the end of Main Street on the east side of the tracks that were laid in 1855, it would serve as the only Illinois Central Railroad Depot and a local inn for more than 40 years. The century-old original Illinois Terminal building sits on the former site of the Doane House. The Doane House was more than a railroad depot and hotel; it also included waiting rooms, a lunch counter, a dining room, pool hall, bar, barber shop, and several meeting rooms. It was the first multipurpose community building in West Urbana. With the opening of the Beardsley Hotel on February 9th, 1896, the Doane House began losing business and closed its doors on July 1, 1898. The last manager of the building, O.F. Spaulding and his family still resided on the premises, but all of the community areas had been boarded up. Eleven days later on July 12, 1898 a fire started on the third floor of the domicile and consumed the entire building. The blaze spread slowly, but firefighters were contending with a lack of water pressure and could not get the blaze under control until it had spread to the lower stories of the building. No one was injured during the inferno, but thousands of dollars of personal property, barber equipment, and telegraph wires were destroyed. Over the years of operation the Doane House saw many visitors, including Abraham Lincoln and Mark Twain. Lincoln stayed at the Doane House in September 1858 during the height of his senatorial campaign against Stephen Douglas. The morning that Lincoln was to travel to the Champaign County Fairgrounds to deliver his speech, a procession met him at the inn’s doors at 10 am. The procession included three local brass bands, 60 ladies on horseback, and a huge throng of local residents, all of who escorted him to the fairgrounds. Douglass spoke in Urbana just one day before Lincoln spoke in Champaign. In honor of Lincoln’s election to the presidency two and a half years after his visit, the Doane House held an inaugural ball on March 4th, 1861, the same day as the inaugural ball in Washington D.C. Champaign’s ball was hosted by George Scroggs, editor of The Champaign County Gazette, William Oliver of the Illinois Central Railroad, and John Dunlap, a local farmer. Admission was $1.25 per person, which would be approximately $31 today. In 1871, Mark Twain visited Champaign-Urbana to give a lecture at Barrett Hall, and while he was here he stayed at the Doane House. His view of his accommodations was not positive, but it may have been influenced by his disappointment about the Chicago Tribune printing his entire lecture text in their newspaper just two days before he gave it. Brehm, Kara, “The Doane House,” ExploreCU, accessed April 18, 2019, https://explorecu.org/items/show/201. Champaign-Urbana Mass Transit District. (2013). Champaign-Urbana Mass Transit District | MTD. 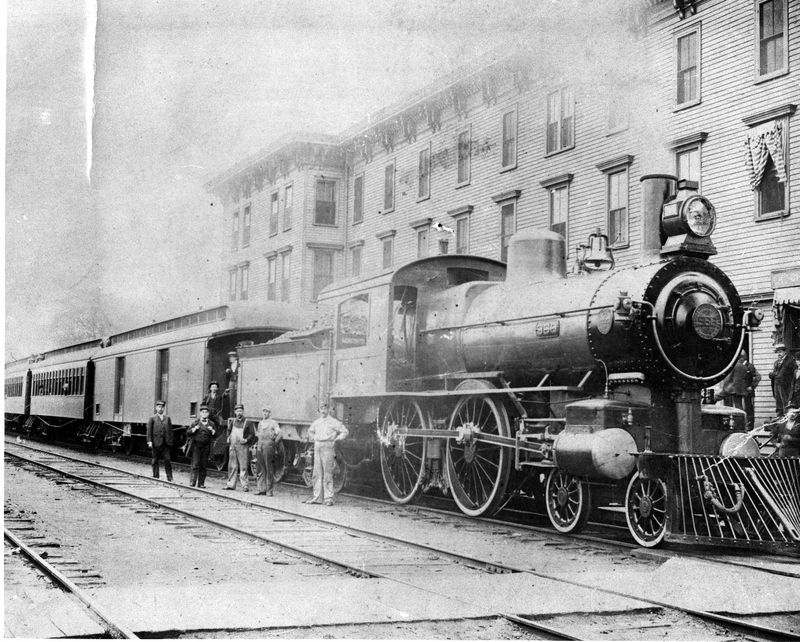 History: Railroads | MTD. Retrieved February 8, 2013, from http://www.cumtd.com/about-us/history/railroads Kachich, T. (2002). Doane House Burns: July 12, 1898. Hot Type: 150 Years of the Best Local Stories from the News-Gazette (pp. 40-4). Sports Publishing, LLC.